Northern Ireland's Gareth McAuley will be fit to face Greece in Thursday's Euro 2016 qualifier at Windsor Park. The West Brom defender sat out training on Monday to allow him an extra day to recover from Saturday's defeat by Crystal Palace. "Gareth was in the wars a bit but he will be fine for Thursday," said Northern Ireland boss Michael O'Neill. O'Neill has called up Bradford City defender Rory McArdle as cover to bolster his weakened defence. Northern Ireland are top of Group F and need two points to qualify. O'Neill said he was "in constant dialogue" with West Brom about the fitness of Jonny Evans. The 27-year-old defender is doubtful for the crunch Group F game after hobbling off with a hamstring injury in the 24th minute against Palace. After the Greece tie, Northern Ireland face Finland in Helsinki on Monday. "West Brom are being fantastic in their co-operation in trying to get Jonny fit for Thursday. He has remained with his club and it's a day-to-day process to see how he is," said O'Neill. "We know Jonny will do everything possible to get fit. We can't leave it too late but with a player of Jonny's stature and what he brings to the team we will give him as long as possible." 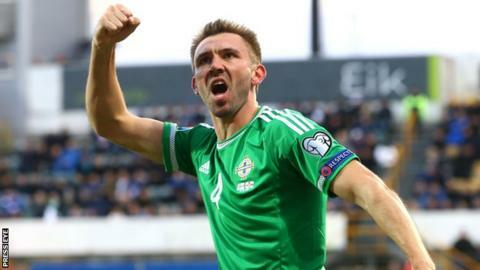 Hawthorns boss Tony Pulis indicated that McAuley, who has scored three goals during Northern Ireland's Euro qualifying campaign, had "played through the pain" with a calf injury on Saturday. Chris Brunt took a blow to the face in the first half of the same match, but returned to the pitch and will be fit to face the Greeks. Meanwhile O'Neill has reported that Aaron Hughes, Billy McKay and Pat McCourt are carrying "niggles" ahead of the Euro qualifying double-header. Neither McKay, nor McCourt, were able to turn out for their clubs at the weekend. Hughes has been lined up to replace the suspended Conor McLaughlin for the clash with Greece, but O'Neill is now expected to add an additional defender to his squad as a precautionary measure. Doncaster Rovers defender Luke McCullough and MK Dons midfielder Ben Reeves have already been called in to join up with O'Neill's squad. Chris Baird and Kyle Lafferty are also forced to sit out the game in Belfast because of bans, with Manchester United's Paddy McNair and Kilmarnock's Josh Magennis their most likely replacements. "This squad has been together for a while now and I have no doubt the players who come in will not let us down," said O'Neill. "Thursday is important but so too is Sunday. We have to prepare with a mentality that qualification could go right down to the 90th minute against Finland. "With that in mind, Conor, Chris and Kyle will begin their preparation for that game already, in the same way they would do if they were playing a club game this weekend."